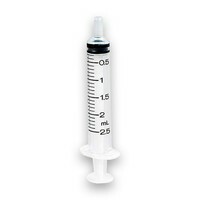 Terumo 3 Part Sterile Syringe 2.5ml is a leur lock tip syringe which does not include a needle. This sterile 3 part syringe features a black graduation that gives the ideal contrast and readability against the high transparency that simplifies inspection of the syringes content. Light lubrication has been added to provide safe and regular sliding motion of the piston.